You want your guests to be talking about your party for months, maybe even years! Magical memories are easily made at a magic party and the best introduction to magic for children is to attend a party with a professional family magician. Everyone remembers their first real live magician. I know that parents want to arrange the best birthday they can for their children because I have two of my own – one in local primary school, the other in secondary school. “Marcus helped make our Christmas party a great success. He was great with kids and adults alike; going table to table he kept us entertained and pleasantly baffled!” Steve, Luton. It’s your party – so it’s up to you! I’ve performed indoors and outdoors, it depends on the event. Outdoors is good, but I find indoors is better. But no-one wants to sit and watch a show in the rain, so if the weather looks changeable it’s best to have an “indoors if wet” option. Where are you based? Where do you perform? I’m based in Worcester Park in south west London, and have lived there for over 10 years. I perform in the surrounding area mainly but I’m happy to travel – in the last year I’ve brought magic to children as far away as Hackney, Wembley and Heathrow! Think you’re too far away? Ask me and be surprised! Do you do joint parties? How big can we go? An easy way to reduce party organisation stress is to have a joint party with another family. Less stress means happy people, so to encourage this I do not make any additional charge for joint birthdays. If you’re inviting the whole class then maybe a church hall or function room is a good idea. My magic show is fun, visual and can be heard clearly as I bring my own PA and microphones. I’ve performed in living rooms and banqueting halls alike. On the other hand – maybe you want to keep it personal? Save the cost of the extra food, save the cost of the hall – have an event that you can invite the aunts and uncles and grandparents to – have the magic happen in your own home. My magic is suitable for all the family, and will amaze all the family – making your party a magical memory they can all treasure. Performing at The Magic Circle’s Saturday family show. Is Your Magic Any Good? Well, I don’t get asked this one, but people want to know! Any magician can tell you their show is a good one but in 2016 Magic Circle invited me to perform at their family Saturday show. This was for an audience from the Young Magicians Club, so kids with a keen eye for spotting how the trick is done! Few magicians get asked to do this so I was honoured to do so and had everyone laughing and amazed! If you’ve seen a “children’s entertainer” who relies on the youth of the audience to fool them then watching a real magic act that confounds young and old alike can be a real eye-opener. After my shows it’s the adults asking how it was done – the kids all know it’s purely magical. The old Criminal Records Bureau (“CRB”) checks were replaced in 2013 by DBS checks (Disclosure & Barring Service). My latest DBS certificate was issued in 2015 for my voluntary work with the local schools. “Marcus provided us with a wonderful night’s entertainment at our Dr. Who Anniversary Celebration in November 2013. It was a truly magical evening enjoyed by all. He kept us amused and baffled throughout with his amazing skills. A sure winner for every occasion!” – Sean Brennan OBE, Mayor of Sutton. You don’t need to worry about cover for untoward events as I have substantial (£10Million) Performer’s Liability Insurance through my membership of the union Equity, like all reputable entertainers. What if it’s a popular weekend? I am getting enquiries all the time, and popular weekends (such as Hallowe’en with my spooky show) get booked up early. You might be concerned that someone else will want a party at the same time as you, but your booking is locked into my schedule as soon as I receive the payment. Sometimes circumstances change and events need to be rescheduled or postponed. Very few entertainers offer a complete no-fee refund but I will refund you in full (after the scheduled performance date) if you have had to cancel, if you are able to give me even only 24 hours notice. Alternatively I will happily carry it over to a rescheduled date. Do you include a disco, facepainting, mascots, balloons and juggling too? I’m a professional magician, specialising in family events. 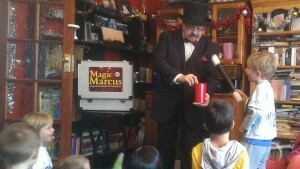 I provide parties with top-quality magic shows that will become a lifetime memory for all guests of all ages. 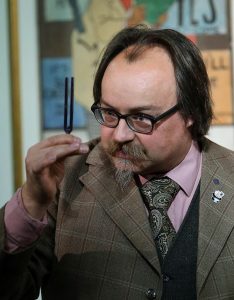 To do this I devote myself to magic and I’m a full member of the prestigious Magic Circle in London (and regularly write for their journal). Children especially have a very firm idea of what a “real” magician should look like, so this establishes my character and raises their expectations. I look great in a waistcoat and top hat! I love hearing people whisper “Look, it’s the magician!” as soon as they see me. Can we take pictures? Video? Of course! Some performers do say no to this, but as a parent I know just how important it is to capture those magical moments – and there will be no shortage of those at your party! I can organise a group photo with all the audience at the end of the show, and am happy to help organise that special ‘cake shot’.